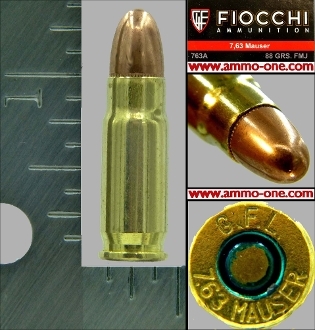 One Cartridge not a box: .30 Mauser or 7.63x25mm Mauser, newly loaded by Fiocchi of Italy , New Fiocchi Base with “ G.F.L.7.63 MAUSER” Head-Stamp with an 88 grain FMJ (Full Metal Jacket) projectile. The 7.63 x 25mm Mauser (also called .30 Mauser) was introduced in 1893 by Hugo Borchardt of the USA, which was adopted for the 7.63x25mm (also called .30 Mauser) Mauser broomstick pistol in 1893. The 7.63 x 25mm (30 Mauser) is "not" the same as the .30 Luger or 7.65 x 21mm Parabellum, which is a shorter cartridge (21 mm vs. 25mm long. Warning to new owners of a Mauser Broomstick pistol: If you have a broomstick pistol, you have a highly prized collectible firearm. Please do "not" use 7.62 x 25mm Russian Tokarev ammunition! It is a higher pressure loading and can destroy your firearm and injure you! Use only real 7.63 x 25mm lower pressure (30 Mauser) ammunition!